Water is one of the Earth's most unusual features. deposition) and recommends treatment of these scaling/fouling waters. form of deposit. Foulants, on the other hand, are usually high in organics. magnesium salts, zinc phosphate and zinc hydroxide. chemical treatments are a few examples of artificially induced foulants. common organic foulants in cooling water systems. chemical reaction and molecular arrangement of the scale crystal lattices). soluble (i.e., their solubility decreases as water temperature increases). surfaces, they precipitate solids due to their lower equilibrium solubility. alterations, pH or alkalinity change or other water conditions. concentrations of dissolved solute than their equilibrium concentration. sites. The nucleation occurs rapidly at high degrees of supersaturation. contact time between the solution and the nucleating sites on the surface. corrosion; makes subsequent scale deposits more adherent. the metal skin temperature is greater than the bulk water temperature. carbonate and also affects the solubility of calcium and iron phosphates. the exception of calcium sulfate. sulfate is a potential problem. revert to orthophosphate, leading to deposition of calcium or iron phosphate. phosphate, because phosphonates can revert to orthophosphate. can be increased by the addition of sodium chloride and nitrate ions. This increase in solubility is known as the uncommon ion effect. basis for scale control by pH adjustment with sulfuric acid. sulfates. The solubility product for calcium sulfate is 1.95 x 10-4.
causes rapid heat transfer loss. coprecipitate with iron, manganese, aluminum and magnesium hydroxides. Soluble silica reacts readily with cations to form various complex silicates. 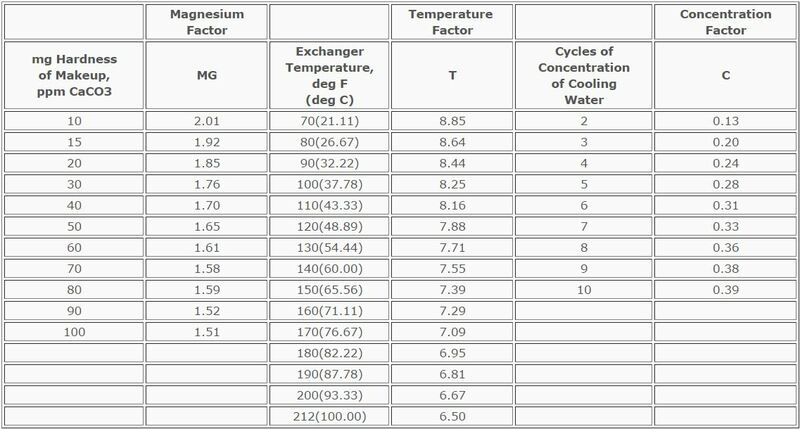 in predicting the deposition of magnesium silicate. manganese is also detected in these deposits. Iron fouling occurs as a result of corrosion processes throughout the system. Thus, it is very important to implement a good corrosion control program. waters, Fe2O3 (hematite) and FeO are the most common iron deposits. considered, such as oxidation, aeration, coagulation, etc. of a zinc product occurs. Zinc hydroxide is a grayish-white precipitate. the Stiff and Davis Index. by using the Langelier Index. Index is zero (LSI = 0 when pH = pHs). A saturation equilibrium exists. There is no scale formation and corrosive attack is minimized. exists with respect to alkalinity and total solids at that temperature. be dissolved. Corrosion of unprotected or bare metal will occur. how rapidly it will form. It is possible for a low-hardness water and a high-hardness water to have the same LSI value. K = a constant based on the total ionic strength and temperature. cycles of concentration are limited by the solubility of calcium sulfate. understanding the types of products. chain length increases. A length of about 10-15 repeating units is best. are believed to inhibit scale deposition by adsorption on growing crystals. the crystallites. Polymers are also used for iron control. complex natural derivative and its structure is not well defined. as dispersants usually have a molecular weight between 1,000 and 10,000.
polyphosphates are used for scale or corrosion control. prevent hydrocarbon and microbial deposition on heat transfer surfaces. as anionic, cationic, nonionic and amphoteric. wetting characteristics of solids, making them either water-wet or oil-wet. use of anionic and cationic surfactants.